A pacemaker is an implanted device that monitors your heartbeat and prevents your heart from beating too slowly. It consists of a box (‘generator’) attached to one or two ‘leads’. The generator is usually placed underneath the skin or muscle beneath your collarbone. 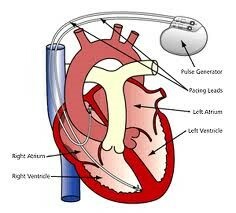 The lead or leads pass inside the large veins of your chest from the generator to your heart. The leads transmit information about your heartbeat to the generator. If your heart beats too slowly the pacemaker sends out a tiny electrical impulse to ‘pace’ the heart, ie to make it beat at an appropriate speed. If your heart then speeds up again, this is detected by the pacemaker, which then stops pacing your heart. What does pacemaker implantation involve? A pacemaker is usually implanted under local anaesthetic. It generally takes ½ to 1 hour, and is performed in a ‘cardiac catheterisation laboratory’. All you have to do is lie on an x-ray table. Your heart rhythm, blood pressure and the oxygen level in your blood are monitored continuously. The doctor will put local anaesthetic under the skin below your collar bone. The anaesthetic stings for a few seconds as it gets to work but the area rapidly goes numb. You may also be given light sedation at this time so that you will be awake but relaxed and a little drowsy. An incision about 3-4 cms long is made below the collarbone. The next stage of the procedure is for the doctor to find a vein through which the leads are passed to the heart. This is not in any way uncomfortable although you may feel a few extra heart beats for a short period. Care is taken to find the ideal position for the lead or leads and you will hear numbers being called out, referring to measurements made through the leads. When the doctor is happy that the leads are in the best position, they are sutured in and a pocket is created to house the generator. This pocket may be overlying or underneath the pectoral muscle. Finally the incision is stitched up. For the skin stitch some doctors use a dissolvable suture while others prefer a suture that is taken out at your doctor’s surgery after 7 days. You will be told which you have. You may need to stay in hospital overnight following the procedure. Your can expect you shoulder and arm to be sore for a few days afterwards. Simple pain relievers like paracetamol are usually helpful. It is important to keep the arm and shoulder moving, to avoid a ‘frozen shoulder’. You will not damage you pacemaker by doing so. You should avoid getting the wound wet for about a week after the implant. The wound usually appears a little bruised for several days afterwards. Although the bruising may become more prominent after you go home, any discomfort and redness around the wound should get better rapidly. If you have concerns about the wound it is important that you contact us directly. After discharge you will be followed up in a pacemaker clinic. The arrangements vary depending on the facilities for pacemaker follow up at your local hospital but generally involve visits to the pacemaker clinic 6 weeks, 6 months and 1 year after implant and yearly thereafter. At these visits your pacemaker is checked to make sure that it is working well and to make any adjustments necessary to the way it is programmed. This visit usually lasts about twenty minutes. You should let us know of any changes to your medicines. Is there anything you should avoid with a pacemaker? If you are concerned about interference from a particular piece of equipment at home or at work, ask your doctor or the cardiac physiologists in the pacemaker clinic. What happens when the battery runs down? The pacemaker battery behaves in a predictable fashion. By following you up regularly we can predict fairly accurately when the pacemaker generator will need replacing. The pacemaker will be functioning perfectly normally throughout this time and we admit you to replace the generator in a planned fashion. Many factors determine how long a battery will last. Currently available generators typically last about 7-10 years under standard conditions. When the generator is replaced the procedure is similar to that of the original pacemaker implant although we aim to use the original leads and simply attach a new generator.